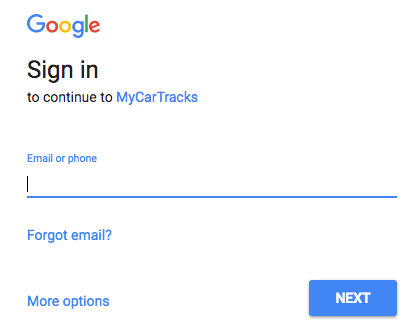 You can use 2 different ways to sign into your MyCarTracks Web Account: Google Sign In or Username and password. The biggest benefit of using Google Sign in is that you don’t need to remember your password and that it’s fast to create the account. After you allow the connection via Google (second step), you can always sign in with just one click. Click on green Get started button on top or anywhere on the page you find it. 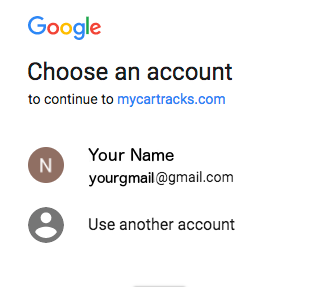 After you enter email or phone and on next step password you will be automatically connected to your new MyCarTracks account. In case your browser is signed into Google Account just choose your account or select other if you want. After you choose the account you will be signed into your web account and you’re done. Alternatively, you may want to create and use your new Web account using Username and Password. Just click on Get started button in the page header and create an account. After you are signed up to your web account just follow the initial welcome wizard. It will follow you with setting up your account and also to connect with your Android app and create the first vehicle.